This stacking guest chair from OFM works great around a conference table or as guest seating in your office or waiting room. 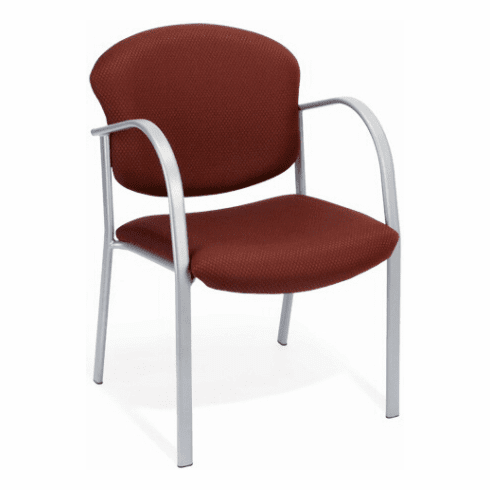 Features include a waterfall seat edge to to promote circulation, frame integrated arms, sturdy tubular metal frame with four post legs, frame features silver finish with your choice of either 4 different fabric or vinyl colors. These stack chairs also features thickly padded seat and backrest cushions, stain resistant fabric or anti-microbial vinyl and can be stacked up to (6) chairs high. This chair meets or exceeds ANSI/BIFMA standards. Dimensions: Seat Size: 19"W x 20"D. Back Size: 20"W x 16"H. Seat Height: 18"H. Overall: 33.8"H x 21.8"W x 25"D. Limited lifetime warranty from OFM. This chair normally ships within 1-2 business days from our NC warehouse.